Every great acting presence possesses an alchemy of its own. 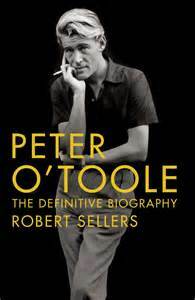 In the case of Peter O'Toole to read the biography is to be reminded of the experience. In “Lord Jim”, on a giant cinema screen in 1965, the camera looked deep into those unique eyes with their fathomless wells of suffering. O'Toole's film record has like all film records its highs and lows. His General Tanz in “the Night the Generals” is to be seen regularly on the Sony film channels. “The Stuntman” of 1980 vies with Truffaut's “Day for Night” to be the film industry's best ever film about itself. His film director Eli Cross is a masterpiece in a master film that is too rarely seen. The material is rich and important. Sadly it is let down by a tabloid treatment in a book that is mainly a rampage through the press cuttings. Siân Phillips does not feature in the acknowledgements and there is hardly a clue to the inner life. The most accomplished aspect of the book is the cover photograph, the work of Wales' David Hurn for Magnum. The proper biography remains to be written. Attention to the art is occasional. Alcohol predominates with carousings with Richards Burton and Harris, an entire weekend of binging with Michael Caine. Off duty from filming “Lord Jim” O'Toole wheels a rickshaw and driver into the lobby of Hong Kong's Peninsula Hotel at two in the morning to buy him a drink. In a rare moment the author locates a quotation that gets under the carapace of alcoholism. “What does anyone get out of being drunk? It’s an anaesthetic. It diminishes the pain.” But the nature of the pain goes unexplored. Sellers prefers film to theatre. He is in the majority there and lets slip his view on Shakespeare in a proposed “Hamlet”. “Olivier also insisted on the uncut version on stage, five bloody hours on stage. When O'Toole does get to play Hamlet the description is remarkable. “It was six blasted nights and two sodding matinees”. An interesting aspect of the editing is that women actors are tagged by first name and men- Harris, Finch, Burton- by surname. Thus “Siân didn’t touch the stuff. The first thing O’Toole did to the poor girl was initiate her into the dark arts of boozing.” As for the marriage “he was never going to be a straightforward nine to five guy, that she knew”. It is remarkable that a treatment that divides the gender should go out in our era under the name of a venerable name in publishing.